Miss Lady Lace is a multi-award winning and international professional pinup girl, burlesque artist and vintage blogger with over eight years of experience. She is the current National Winner of the Australian Pinup Pageant and been published countless times nationally and internationally. 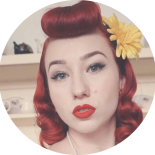 Miss Lady Lace’s Pinup Academy encompasses her courses and workshops which have been carefully designed for a fabulous vintage time with with focus on sharing her passions with you. Both courses and workshops will be available within the genres of pinup, burlesque and vintage dancing, retro styling with both regular and one off events. If you’d like more information, to book, or have a question about anything vintage related please don’t hesitate to email Miss Lady Lace through contact@ladylace.com.au. Join Miss Lady Lace’s Pinup Academy! Miss Lady Lace has a private group for students which includes details about upcoming event. Click here to join this! Learn all about burlesque in an exclusive performance class, with the opportunity for group and solo performances, which are completely optional. This class is suited to all those whether learning the basics or working on solo development. A fitness class incorporating elements of burlesque, vintage dance, fitness, strength and stretch. This class is perfect if you’re look to improve your general fitness, or condition your body for professional dancing. (yoga mat or towel require for this class). This is a free pre-class event which includes a 10 minute guided stretch, discuss solo performance ideas, work on developing characters, test out acts, and create a supportive community. Casual Vintage Classes are a glamorous weekly drop in class suited to all levels of dance. Each week a new vintage style of dance is learnt focusing on fitness, technique, and learning a new routine. Pinup Society Magazine Launch Party.